I’ve never had a diaper quite like this one before. We have fitteds, and we have pockets, but this is the first diaper that is both! “Located in beautiful Bend, Ore., ‘Poodelum & Missy Kate’ began on the far end of my enormous kitchen table with my sister’s borrowed sewing machine. Just this last spring, I decided to make a change. Our youngest, now 9 months, was going through disposable diapers with lightning speed. 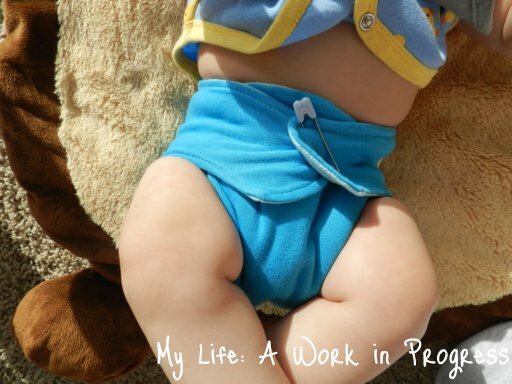 I had always been curious about cloth diapering and decided to take the plunge. I already did a TON of laundry anyway, so why not? My curiosity grew when I found out how many different kinds/types/brands there were. I asked all my mama friends to share any knowledge they had and began searching blogs for any insight mamas I didn’t even know wanted to share with the world. I became obsessed. But not really obsessed to the point where I buy every different kind/brand out there. I became obsessed with figuring out how to make them myself. I received a one-size hybrid pocket fitted to review. The outside of this diaper is made of cotton interlock, and the inside is lined with french terry cloth. French terry cloth is not considered a stay-dry fabric, but that is normal for a fitted diaper. Because this is a hybrid fitted, there’s a layer of fleece sewn in the middle to help the outer layer stay drier longer. However, this diaper does need a cover to be completely waterproof. The pocket of this diaper is quite wide, so an insert can be used if desired for extra absorbency. I used it with a BumGenius insert, and it fit quite nicely. Since this diaper doesn’t come with a closure, a Snappi or diaper pin should be used to close it. Because of this and the fold down rise, it’s easy to adjust this diaper to fit all sizes of babies. 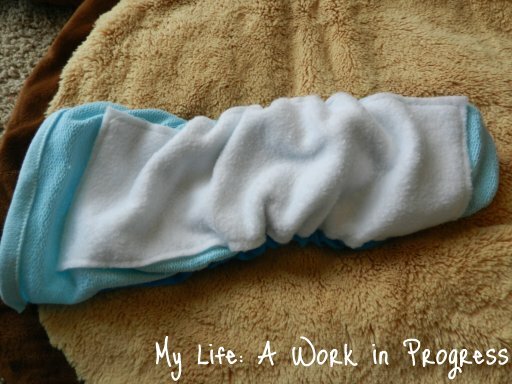 This can be a great thing for newborns, small babies, or skinny babies. Because of the fabric used, I wasn’t sure how well a Snappi would hold it together, so I used a diaper pin. My son is really squirmy, so I did struggle getting the diaper fastened with the pin. However, I know many parents have become well-practiced at using pins and can do it quite quickly. Also, Kate mentioned to me that she has become adept at fastening a cover over this style of diaper without a Snappi, pin, or any type of closure. If you’re not sure that a no closure diaper is for you, Kate does make them WITH closures. With one microfiber insert inside, this diaper started to feel damp on my son after two hours, so I definitely recommend using this with a cover. An extra insert or doubler can also be used. On its own, it’s a simple diaper without a lot of bells and whistles. But what it does have is the ability to be customized to fit many sizes of babies: from the very thin to the very chunky. It’s made well with even stitching and nice, wide elastic. It’s also very reasonably priced: without closure $13, with closure $14. Besides the hybrid pocket fitted diaper, Poodelum & Missy Kate also sells pocket diapers, all-in-twos, hybrid fitteds, fitteds, fleece soakers, wool soakers, and inserts. You can win a $25 gift certificate to Poodelum & Missy Kate to choose and purchase your own diaper! Come back to My Life: A Work in Progress on Oct. 25 for the Hoppin’ Halloween Giveaway Hop (Oct. 25-31). Can’t wait? Visit Poodelum & Missy Kate on Facebook to buy your own! 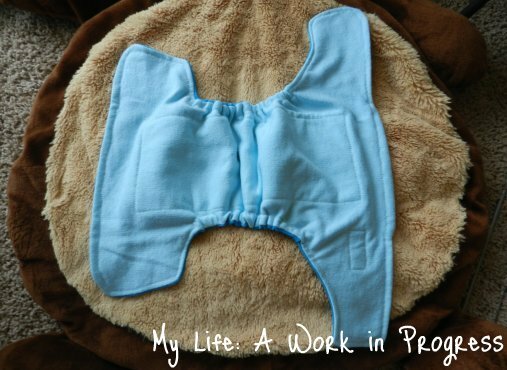 I love pocket diapers, I love to control the amount I can add. I am glad she makes them with closures, pins are not for me, and Snappi’s are often misused by my older children. I agree that i like to control the amount, and closures just make things easier…i have pricked myself to many time trying to use diaper pins…or pricked the baby. 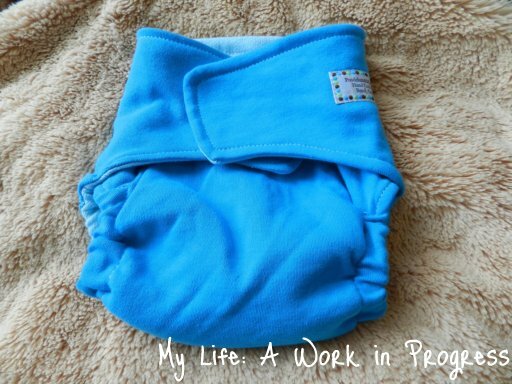 I just got a Poodelum & Missy Kate fitted diaper – it is so soft! 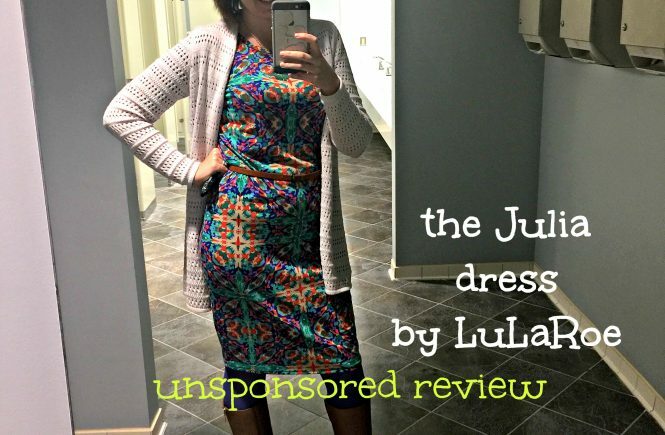 I love the idea of a fitted pocket – you get the best of both diapers! I’m curious if anyone has tried these with a snappi or boingos. It looks soft and comfy but I’m scared of pins! I tried it with a Snappi, and I didn’t think the Snappi grasped that particular fabric very well, which is why I went with a pin. She does make this style of diaper with a closure option too for $1 more. So that’s what I’d recommend if you don’t like using pins! So cute it looks very comfortable! I am intrigued by this diaper! I love that it is a fitted and a pocket in one, I’ve never tried a diaper like that before!! I like that the pocket is wide, I’ve never tried a diaper without closures but the fit seems like it works really well. Since I have a skinny babe, I really like the idea that you can have snaps or no snaps! So many ways to adjust it! The cloth diaper with inserts looks really easy to use, especially for someone like me who’s never used cloth diapers before! I recently tried my first snapless diaper and I actually liked it. I was able to get a perfectly snug fit on my son without trying different options….it was quick and perfect. I’ve never seen a fitted with pocket before. Genius! I love how customizable it is! Being able to add an insert is great for naps or heavy wetters! Omg! Freaking cute diapers! I would definitely have to order the ones with closures though! I tuck diapers inside a cover with no closure all the time. It works pretty well for me. Here’s a weird random thought. Has anybody ever tried making diapers with a magnetic closure? I guess it might be a problem in the laundry though, cause they would stick to the sides of the washing machine and not circulate very well and get clean. I’ve never heard of anyone trying that! Hmmmm interesting! I’m glad she makes them with closures because I am too nervous to use pins! I like that it will fit many different types of inserts! I like that she sells wool soakers! I wonder if a Boingo would work well for fastening it. I love the idea of a pocket fitted! I’m not opposed to using pins, so these look great!